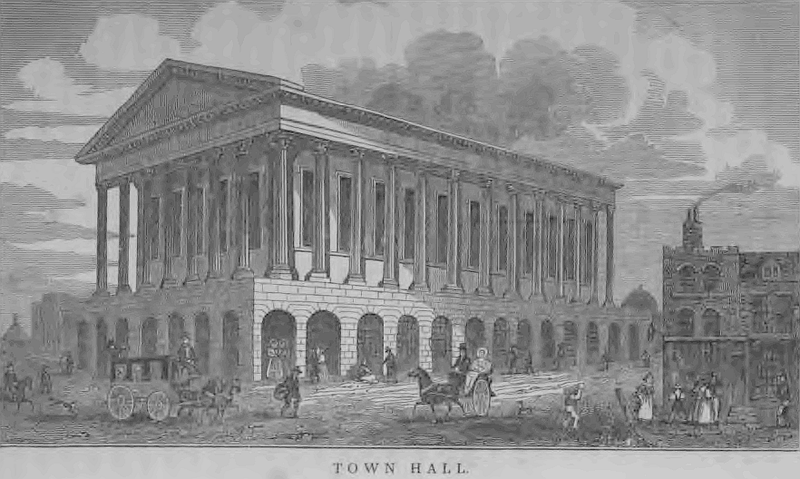 The town hall was (and still is) a prominent building in Birmingham Town Centre. It occupies an elevated site adjacent to Paradise Street and in the 19th century was conspicuous from all parts of town. The Town Hall was built between 1832-1834 when there was nothing in the local area to rival it for size. Buildings such as the Council House and the Chamberlain monument, which now sit alongside it, were not erected until years later. See 19th Century Birmingham Chamberlain Square for more details. The design of Birmingham Town Hall is based on the Temple of Castor and Pollux in Rome. The Hall itself stands on a basement 20 feet high and is surrounded by Corinthian style columns, fifteen on each side, and eight at each end. It measures 145 feet in length, and 65 feet in breadth and height, and is capable of holding 4,000 people. The Hal houses one of the largest organs in England, built by Hill. Standing 45 feet high and 40 feet wide it has 4,000 pipes, four sets of keys, and nearly 80 stops. The hall contains a bust of the German composer, pianist, organist and conductor, Felix Mendelssohn. The Town Hall was built at a time when Birmingham was at the forefront of protests for national democratic reform and provided the people of Birmingham with a forum for political debate. Indeed, until 1870 it was the meeting place for local government and serving Prime Ministers of the day. Politicians of the day known to have made speeches here include Joseph Chamberlain, initially a local councillor before moving to national politics, and the Liberal Prime Minister William Gladstone. The Town Hall hosted a wide variety of other events including music festivals and public readings. In 1853, Charles Dickens gave his first public performance of A Christmas Carol here. He also gave other public readings to raise money for the Birmingham and Midland Institute.